This red, white, and blue candle holder would be a wonderful addition to your Fourth of July celebrations and certainly a conversation starter. Made entirely of re-purposed glass. 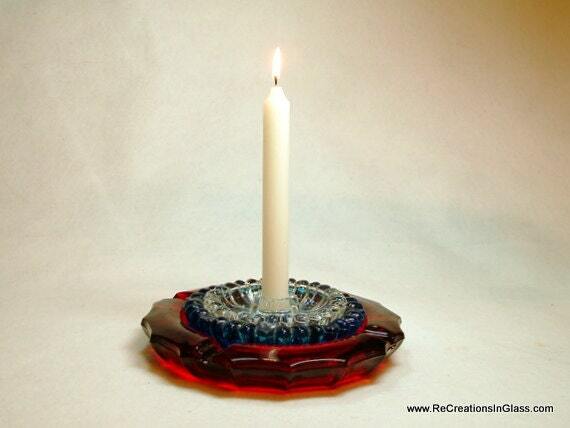 Each piece nests perfectly into the next with the center being a candle holder. It would make a great hostess gift. This piece can be made into an "ever-blooming" flower upon request. I will glue an attachment onto the back into which you can insert a garden stake. Wouldn't that be great near a front door for the Holiday? This item is available for purchase. If interested, please click this link.